Pressure Chamber (Pressure Bomb) technology continues to receive a lot of interest as water resources are stretched. Although the technology has been around for years, the recent publication of crop levels for Almond has increased interest from growers as the Pressure Bomb becomes a standard method for plant based irrigation decisions in the orchard. The Pressure Bomb has been shown especially helpful in the Almond orchard for helping discern when to begin irrigation for the season. Plant based measurements are also extremely helpful in keeping the orchard well irrigated for optimal growth but not over-irrigated during hull split and pre-harvest which can lead to disease and problems at harvest. The Pressure Bomb allows you to monitor the stress level in the tree. There are many “shades of grey” between “well-irrigated” and “water-stressed” trees. The Pressure Bomb allows you to monitor these shades of grey and keep the tree well irrigated during times of growth yet the ability to stress during hull split and right prior to harvest to ensure a good split and good release of nuts. 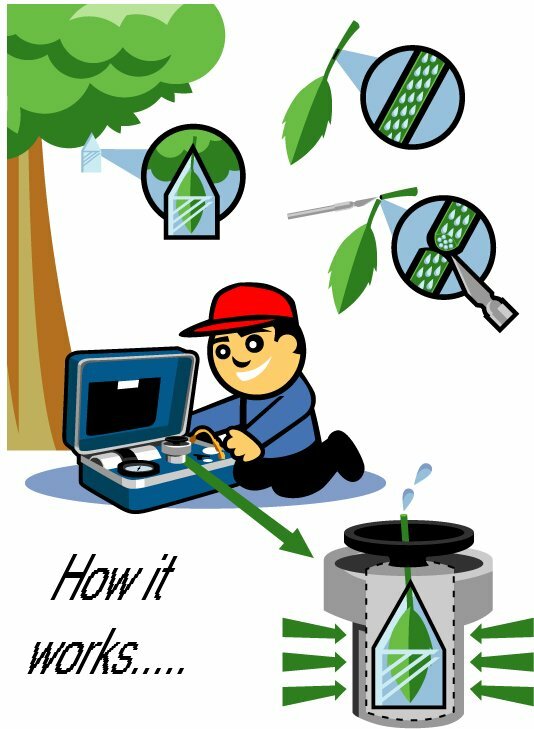 Using a plant based monitoring system like the Pressure Bomb you monitor exactly what the tree is experiencing not just one of the environmental stresses. 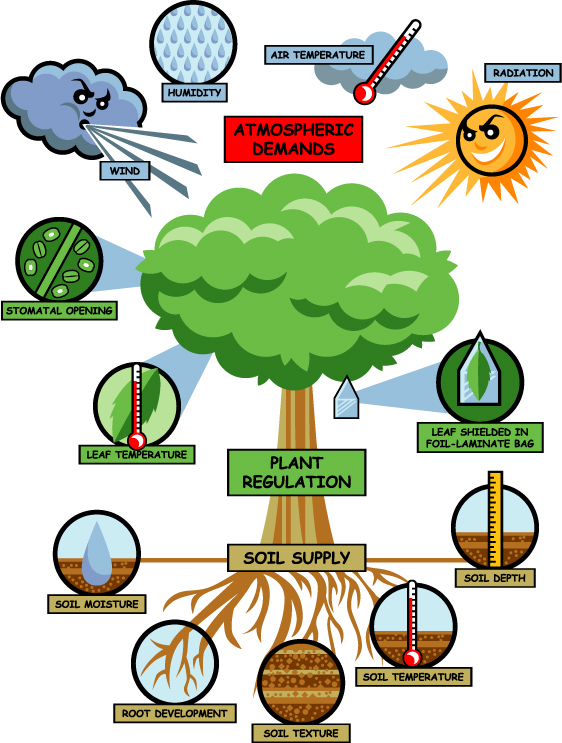 Plant water stress is a sum of four environmental influences; soil moisture, humidity, wind and direct sunlight or heat load. (See graphic below) While most monitoring systems only monitor one of these influences, the plant based measurement takes all four into consideration. To view a picture tutorial using a Pressure Chamber with almond trees. To watch the same tutorial in video or see below. The next question is which instrument works best with Almond trees. There are four instruments that will work well for Almond. Each has different qualities that appeal to different growers. The Model 615 is our newest instrument and is the product of our customers input. The instrument comes fitted in a dust-proof case that has 5 tie-down rings for easy mounting on an ATV (4-Wheeler). The 22 cubic foot tank is removable for quick replacement or can be trans-filled. The instrument comes with a shoulder strap and bail-spring handle for easy transport by hand. The instrument is fitted with our Compression Gland Sealing System which works excellent with Almond. Please request the Almond Insert and Gasket when ordering. The Model 610 also has a 22 cubic foot tank inside, but the tank is fixed and cannot be removed. This instrument does not come completely enclosed but instead is completely exposed for easy use. This instrument is completely self-contained and can be easily strapped onto the rack of a 4-wheeler or hand-carry into the orchard. The instrument is fitted with our Compression Gland Sealing System which works excellent with Almond. Please request the Almond Insert and Gasket when ordering. The Model 600 is also a popular instrument. It does not come with a tank and thus needs the Portable Tank. This durable field unit is normally placed in a plastic box lined with foam or a blanket and strapped to a 4-wheeler when used in orchard applications. It can also be hand-carried. It is also fitted with the Compression Gland Sealing System which works excellent with Almond. Please request the Almond Insert and Gasket when ordering. The Pump-Up Chamber is a good low-cost alternative for a grower with small acerage. No source of pressure is needed since it works like a bicycle pump and the pressure is created by pumping the instrument up and down. It is a highly portable and light weight instrument. The pump is capable of producing about 7 psi or 1/2 Bar per stroke. When ordering for use with Almond request the Small Sealing Lid. 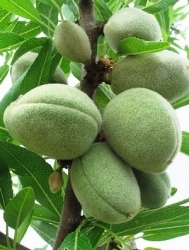 instruments with Almond or any other crop, please contact us directly. Using the Pressure Chamber for Irrigation Management in Almond. UCCE contributors: Allan Fulton, Richard Buchner, Joe Grant and Joe Connell. ANR Publication 8503. May 2014. The Almond Doctor. An article by David Dhol – UCCE with some recommendations for surviving the California Drought.